On November 13, as part of the activities of the exhibition Contemporary Seals by Li Lanqing, the Symposium on Improving National Quality Education and Presentation Ceremony of the Book Education for 1.3 Billion was successfully held in London. The event was jointly organized by the Chinese Embassy, China’s Ministry of Education, Peking University and the University of London. About 100 guests attended the event, including Professor Wei Yu, Member of the Chinese Academy of Engineering, Advisor of National Chief School Inspectors, Member of National Education Advisory Committee and former Minister of Education, Mr. Cong Peiwu, Charge D’affaires of the Chinese Embassy, Professor Wu Zhipan, Executive Vice President of Peking University, Ms. Elizabeth Truss, Parliamentary Under Secretary of State of UK Department for Education, Professor Chris Husbands, Director of the Institute of Education, University of London and the representatives from the Chinese and British education institutions, universities and Confucius Institutes in London. Professor Wei Yu and Ms. Elizabeth Truss addressed the ceremony on behalf of the Chinese and British education authorities. 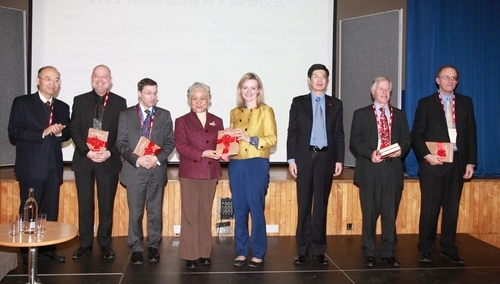 They spoke highly of Mr. Li Lanqing’s educational thinking and devotion to the development of education in China and expressed the hope that the book Education for 1.3 Billion (English version) would further promote deeper understanding between China and Britain of each other’s philosophy, policy and practice of education and lay a solid foundation for the cultural exchanges between the two countries. Charge D’affaires Cong Peiwu read out Ambassador Liu Xiaoming’s message of congratulations. In his message Ambassador Liu said that Education for 1.3 Billion is an important book reliving the ten-year reform and development of China’s education at the turn of the century and manifests Mr. Li Lanqing’s educational ideals and the tough decisions he made. He said that it is an excellent book for educators around the world, because it will help China share educational experience with the UK and beyond. At the Symposium, Chinese and British experts and scholars from Peking University, Shanghai Normal University, Shaanxi Normal University and the Institute of Education, University of London conducted lively discussions on how to improve the national quality education and other topics of common concern. Professor Wei Yu, Charge D’affaires Cong Peiwu and Professor Wu Zhipan also presented the book Education for 1.3 Billion to the UK Department for Education, the Institute of education, University of London, Confucius Institute for Business London, Confucius Institute for Traditional Chinese Medicine, London, Confucius Institute at London South Bank University and Goldsmiths Confucius Institute for Dance and Performance. The book Education for 1.3 Billion (English version) written by Mr. Li Lanqing is jointly published by the Foreign Language Teaching and Research Press and the Pearson Group. It is an important book on China’s reform and development in education in a period of 10 years. The book vividly recalls the achievements and experience in China's education reform and development from 1993 to 2003 and narrates how a developing country with a population of 1.3 billion managed to transform its heavy population burden into huge human resources through education. It is a valuable record of the great changes in China’s education in 10 years.